Anyone who says that Africa's not a country has never been to Wakanda. Like a country rich on nazi gold, it's convenient to close your borders and claim neutrality when you're rolling in it. I'm with Killmonger - he won the throne fairly by their own stupid, violent traditions - the following scuffle was treason! Also the tech was a constant irritation to me - like watching TV on a hexagonal screen? And if you're chatting via wrist-holograms, wouldn't you both be looking down? Somehow I managed to miss being swept up in the whole cultural/social phenomena around this film and finally just got around to watching this Best Picture nominated film. However, subsequently I let the hype around this MCU movie be built up enough for it to ultimately be a disappointment. 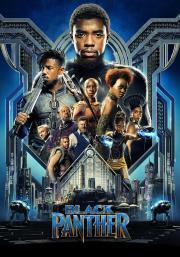 Unfortunately it felt like Disney dumbed-down the dramatic Wakanda aspects to shove in surprisingly cheap looking average to mediocre superhero popcorn fare to make for an entertaining mixed-bag blockbuster. Social criticism for people who think socialism is served by social media. Average, not much else to say, but a better than usual Marvel villain who still wasn't properly used to full potential. Very by the numbers, very serious, quite boring. I did like the third act. I think if I was Morgan Freeman, Laurence Fishburne, Denzil washington, Halle Berry or Viola Davis, I would be pretty gutted that this appalling tripe was even considered for the Oscars. After decades of brilliant performances by black artists, it is a travesty that this mess was in the right place at the right time to take advantage of the "lack of black actors" bandwagon. Forced humour, everyone talking like Nelson Mandela, horrible! At least we got a new phrase for God-Awful: "Leap the Rhino"
A lot of fun, while also capturing an important divergence between reform and revolution. Politically speaking, when considering the damage that technocracy and the political elite have wrought on the world, some viewers like myself might find themselves sympathizing more with Killmonger than a brief plot summary might suggest, which I think very well might’ve been an intended effect by Coogler. I'm fed up with superhero movies and generally find message movies very tiresome, so odds were against me liking this one from the get-go. The main problem with BP is that both sides are unappealing. T'challa is an privileged king, Warmonger a Black Lives Matter parody. We see too little of Wakanda too, it's one street and a bunch of nobles. BP is also too similar to other films, especially The Lion King. A less safe and predictable plot would have gone a long way. They could have cut some of the music, bad CGI and fight scenes to make room. It's also grating that Africa is used as a prop and only two of the actors were born there. A standout from the other Marvel films for its excellent score, costume design, ensemble cast, and story that feels like it has more to say. The CGI is noticably bad for a lot of the film, and some of the action scenes, such as the last big battle, felt trite and rehashed. The world building was OK, though there is little that is actually seen of Wakanda outside of a few buildings and some rooms. Overall, there is some things that make it stand out and elevate it a little above the MCU forumla. The movie is not bad at all. Wakanda and the soundtrack are both beautiful and together they definitely give a very relaxing and enjoyable atmosphere. However, the movie is far from being so good to be nominated for the Best Picture Oscar, and I am sure that the comitee voted for it because of the strong political message and not because of the quality of the movie.